Install data miner Deducer in Ubuntu 13.10 | goFLOSS! 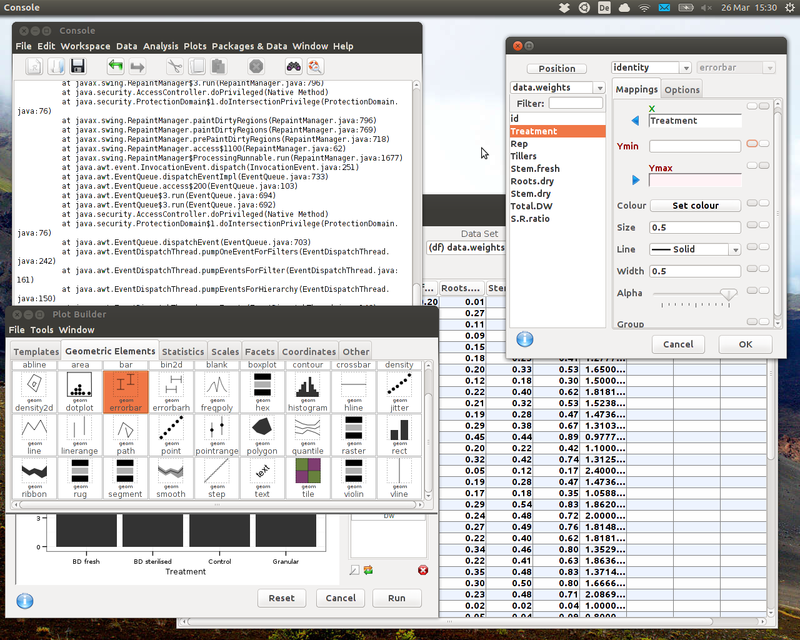 Deducer is a data mining GUI for R, the open source software environment for statistics. It can be pretty useful for some people as it makes it less difficult to learn how to analyse some data and create plots (thanks to the ggplot2 package) without struggling with only command lines. Deducer is a great way to use ggplot2‘s plotting capabilities without having to go through the trouble to learn all the details about each command. The package still works the same, using single elements that we can add to the plot, but the GUI makes it a whole lot easier. Here are the easy steps you need to follow to install Deducer in R on Ubuntu 13.10 (and probably other versions of Ubuntu too). It is assumed here that you already have a recent version of R installed on your system (if not, head to this page to install a PPA). As the interface needs Java support in R, you will first need to install a Java Development Kit. Just go to the Software Center and get openjdk-7-jdk (other versions are available but this one worked fine for me). Now you can enjoy using this useful piece of software! I found that the GUI had issue with me using multi-monitors (windows out of range, tooltips jump to other screen…), but switching to just one works flawlessly. Edit: I just found that someone has done a way better job than me at detailing the steps to follow to get Deducer nicely integrated in Ubuntu. If you want more details about installing R, adding extra useful packages and creating a launcher that opens Deducer straight away, see Iurie Malai’s amazing article. ← How to contribute to OpenStreetMap without editing the map?